The world’s largest brewers from Europe to Asia are lining up for a chance to buy a stake in Vietnam’s top beer-maker, in a deal worth at least $1.8 billion as consumption in the Southeast Asian country surges. Dutch brewer Heineken NV, Anheuser-Busch InBev NV and its merger partner SABMiller Plc, as well as Japan’s Asahi Group Holdings Ltd. and Kirin Holdings Co. are among seven foreign companies that have registered to bid for stakes in Saigon Beer Alcohol Beverage Corp., also known as Sabeco, its chief executive officer Le Hong Xanh said. The deal is garnering interest from foreign beer brands attracted by Vietnam’s young population and rising middle class in one of the world’s fastest-growing economies. Its government is divesting stakes in its two market-leading brewers as a growing budget deficit forces the leadership to accelerate a plan to reduce holdings in state-owned firms. Thailand’s Singha Asia Holding Pte. and Thai Beverage Pcl have also signed up to take part in the Sabeco auction, while Vietnamese brokerage Saigon Securities Inc. has joined the latest list of local potential buyers, said Xanh. That line-up is not permanent, and companies could drop out or more could join the list, he said. Asahi “is interested in acquiring Sabeco,” its Tokyo-based spokesman Takuo Soga said by telephone. AB InBev, Kirin and Heineken declined to comment. Spokespersons for Saigon Securities, Thai Beverage and Singha-owner Boon Rawd Brewery Co. weren’t immediately available for comment. Asahi shares rose as much as 1.1 percent in early Tokyo trading Thursday, before paring those gains to fall 0.1 percent, while Kirin declined as much as 1.6 percent. Thai Beverage fell as much as 1.5 percent in Singapore. The Ministry of Industry and Trade announced Aug. 31 the government’s plan to sell its entire 89.59 percent stake in Sabeco, which it has valued at $1.8 billion, and its 82 percent holding in Hanoi Beer Alcohol Beverage Corp. for $404 million. 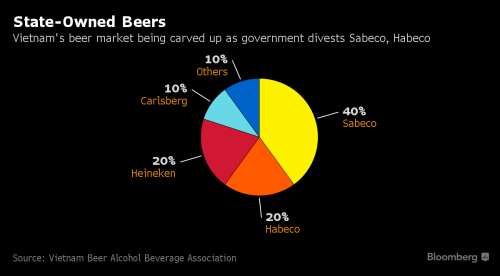 Sabeco will be sold in two tranches in 2016 and 2017, while Hanoi Beer, or Habeco, will be divested this year, it said. “There aren’t that many markets where foreign brewers would have a chance to secure an interest in a market-leading brewer,” said John Ditty, managing partner of KPMG Vietnam’s deals advisory unit. The government’s valuation of its stake isn’t “too much,” he said in an interview in Ho Chi Minh City. Sabeco has strong brands and an existing distribution network, so what investors “have to decide is how much of a premium that is worth,” Ditty said. The brewer expects net income to rise 10 percent to about 3.76 trillion dong ($169 million) in 2016, from 3.42 trillion dong it reported in 2015, double its target growth rate for the year, Sabeco’s Xanh said. That would put the Vietnam government’s valuation of its stake at about 11 times net income, compared with the median of about 62 times for brewery acquisitions announced worldwide in the past three years. Some of the government’s stake in Sabeco will be listed on the Ho Chi Minh City Stock Exchange in as soon as 45 to 60 days, Xanh said. After that, the government will auction 53.59 percent in the company within the year, and the remainder in 2017, he said. The proportion to be offered publicly will be decided by the ministry, Xanh added. Prime Minister Nguyen Xuan Phuc, who said Aug. 29 Sabeco and Habeco must be publicly listed before the state divests them, will need to approve the entire process, Xanh said. The government wants the market to determine the price of stakes in Sabeco, and its listing will be overseen by Maybank Kim Eng Securities Thailand Pcl, he said. Sabeco, brewer of Saigon Beer and 333 Beer, prefers to have several major shareholders, and its auction could attract more domestic companies, some of which could form joint ventures to pool resources for their bids, Xanh said. He declined to name other interested local parties. In the case of Habeco, Danish brewer Carlsberg A/S has been awaiting the government’s permission to raise its 17 percent stake to 30 percent in the smaller state brewer, based in the capital Hanoi in Vietnam’s north. Foreign brewers are raising their stakes in Vietnam as beer consumption in the country rose 6 percent in 2015 and is expected to keep growing until 2020, according to Euromonitor International. By contrast, key Asian markets such as China, Japan, Thailand, and the Philippines declined last year. “Vietnamese like to get together and whenever they do, beer is a must to drink,” Xanh said.